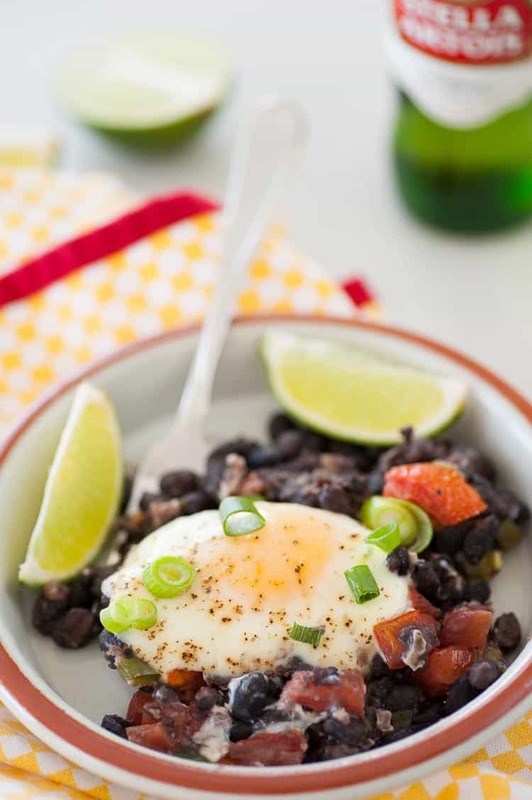 Black beans rancheros is a hearty breakfast/brunch meal which requires little prep time but comes up with loads of flavor. Fix this when you need a high protein burst of energy to get through a busy day. 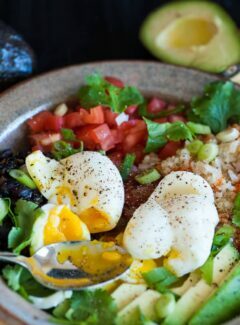 This Mexican inspired recipe is a traditional savory breakfast with beans, tomato-chile sauce, maybe some corn or rice. This gets served on a fried corn tortilla and gets topped with a fried egg. You can make it with as much spicy heat as you’d like. This recipe is fairly tame when it comes to heat. You could make the recipe as it is and have a bottle of tabasco on the side for those who like more spice. Using a hotter pepper than jalapeno is an option too. A serrano pepper is twice as strong as a jalapeno. A half teaspoon of powdered cayenne pepper could get your eyes watering and nose running. If it’s a Mexican inspired dish, I just think that it should have a fair amount of heat. I found a website that has a good chart of peppers and their Scoville rating you can take a look at. The Scoville scale rates peppers for heat based on the amount of capsaicin they contain. Here’s the chart posted by none other than CayenneDiane. Good name for a pepper expert. 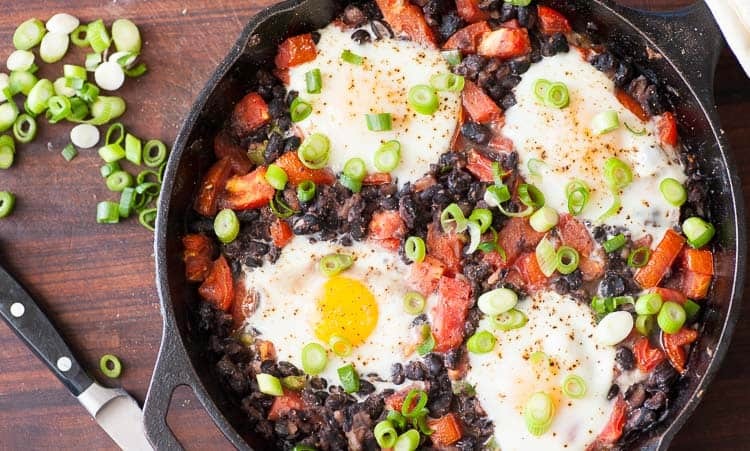 This recipe, which is an adaptation from a Mark Bittman recipe, heats up the black beans rancheros in the oven and then cooks the eggs in the oven too. If you would like to speed up the dish, it could be heated up on the stovetop and fried or poached eggs cooked separately. I like the idea of a one skillet dish as I’m not too fond of the clean-up. Simpler is better although it takes a little longer to make. 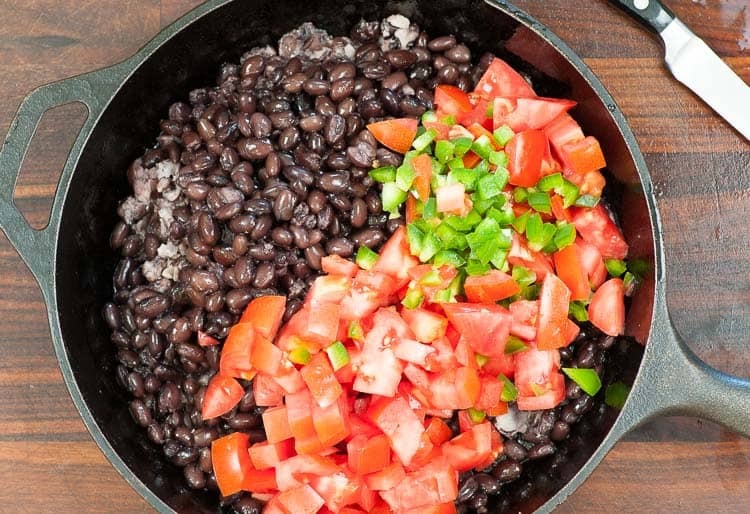 One can of black beans gets a good mashing before the rest of the ingredients are added. At this point I’d like to add that a little more liquid could be added to the beans. I’m pretty sure that Bittman figured that the tomatoes would have enough liquid in them to soak into the crushed beans. Well, unless you are growing your own tomatoes and have some really ripe ones, the store bought variety is usually lacking that much moisture. Maybe by chopping the tomatoes a little finer than I did would help. Or, add 3 or 4 tablespoons of vegetable broth. Your call on this one. 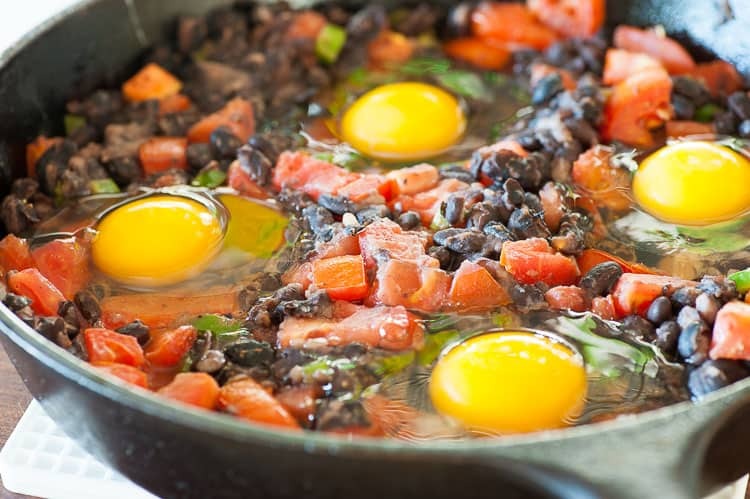 After 20 minutes in the oven the tomatoes will be cooked down and the black beans rancheros is ready for the eggs. 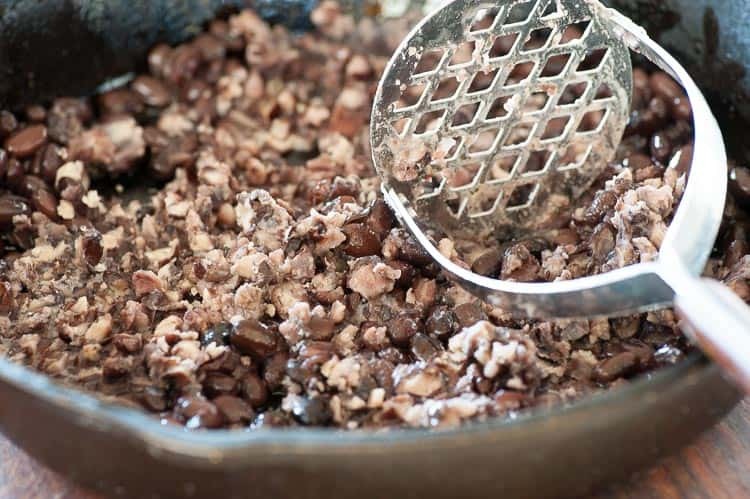 Take a large spoon and press into the beans to make an indentation for the egg. Throw a little salt and pepper on the eggs and put the skillet back into the oven. In 15 to 20 minutes the egg whites should be cooked and the yolks runny. 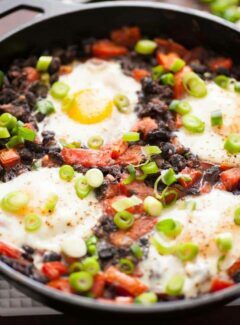 Spoon the eggs out with a good amount of the beans and tomatoes and serve right away. If you wait too long or have to take pictures…wink…the eggs will keep cooking and the yolk will firm up a bit. That’s not a real big deal but I prefer my yolks juicy. To really enjoy this breakfast, it’s important to have a garnish and fresh lime juice. Green onions or chopped cilantro or both for the garnish is perfect. 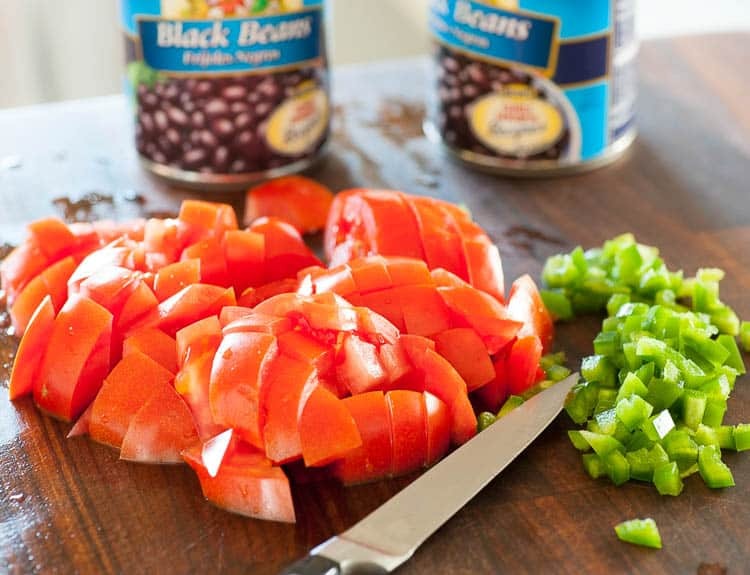 Then, squeeze some fresh lime juice over the beans for a refreshing citrus flavor which goes well with the spices. Being a blogger, I didn’t wake up at 6 in the morning to make this for breakfast. This was started mid-afternoon and turned out to be our evening meal, so…necesito una cerveza. Tasted darn good with the egg and beans. Try this recipe but feel free to mix it up a bit, adding your own flavors as you see fit. Make this recipe a springboard for your creation. 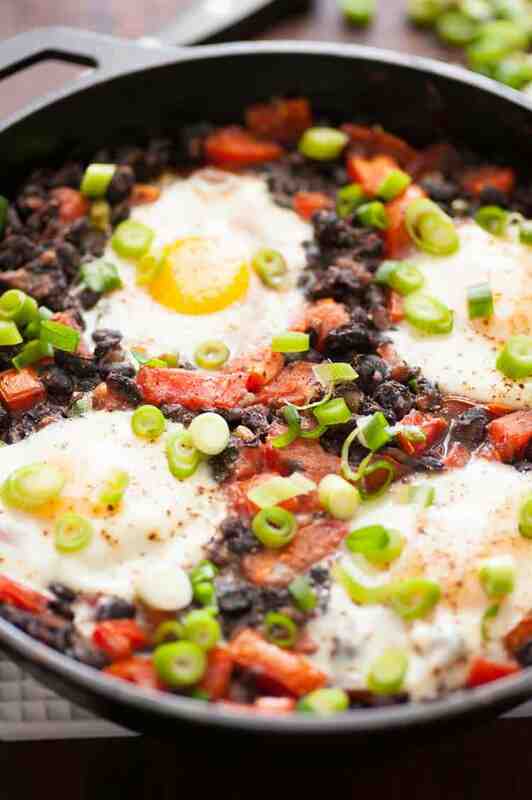 Great hearty breakfast or brunch meal. Coat a cast iron skillet or oven safe casserole dish with the olive oil. Place into the oven 20 minutes to heat. Remove from the oven and use a large spoon to make 4 indentations. Crack one egg into each pocket. Place back into the oven, 15 to 20 minutes until the egg whites are firm. Serve garnished with green onions or chopped cilantro. Drizzle with fresh lime juice. Adapted from a Mark Bittman recipe. This sort of thing is my most favorite kind of breakfast (or lunch or dinner!) – I love that you cooked the eggs right in the pan with everything else – that’s how I like to do it, too! Hey April…it is a dang good breakfast. Delicious! 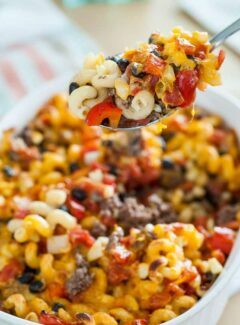 Just tried this now and it was such a quick and tasty dinner! Hey Mia…so glad you liked it. I could eat this once a week for the rest of my life!